NES Streemerz: Super Strength Emergency Squad Zeta "Superb Joe mode" in 00:53.45 by MESHUGGAH. Inspired by the Action 52 game of the same name, Streemerz is a NES port (by thefox) of a Flash game made for the "Action 52 Owns" game jam by Arthur 'Mr. Podunkian' Lee. 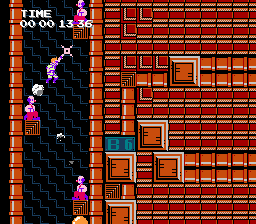 It is remade in Bionic Commando style, with grappling hook usage and all. This run plays through "Superb Joe mode", a time trial mode of sorts, and finishes with an in-game time of 0:45.49. The author, MESHUGGAH, also improves his previous movie by 0.31 seconds thanks to better optimization and lag reduction. There is also a run that completes the game in "Streeeeemerz Mode" by adelikat, Aglar, Mothrayas, Really_Tall and Samsara.